I’ve been busy planning our 2nd annual Easter Egg Hunt Party and I thought I would share pictures from our party last year. This was such a fun party to plan and the kids had lots of fun, I can’t wait for this years party! Do you have plans for an Easter party this year? The party was outside at a fabulous local park and the perfect setting for our fun filled afternoon. 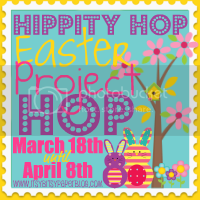 I used the Easter party package from Dimpleprints to create this bright and fun party. I had a short turn around time and put the party together in 2 weeks, but I love how it turned out and the kids had lots of fun! Here are some of the pictures from the party. I kept the food simple since we were outside. We had sandwiches, rabbit food (carrots & celery), chocolate covered pretzels, popcorn, Oreo cake balls and the cutest bunny cupcakes. To keep the kids entertained (and out of the eggs before we started the egg hunt) we played a few games. Sack races are a nostalgic and fun game, perfect for an Easter party. I made burlap sacks and attached fluffy yarn tails for “bunny hop” races. The kids put on bunny ears and hippity hopped to the finish line. I’m also sharing this party here. So awesome Mariah!! I love the Easter bunny sack races – we might have to do that with the kiddos this Easter. Mariah, I love all of your decor. I was on the Dimpleprints site and am trying to make the Lollipop covers from the tutorial. The measurements seem off. I tried to score them at the measurements on the tutorial and it doesn't look right. Please help. Spring is in full swing here and that means Easter is just around the corner. I wanted to create a fun family event that will be a tradition for years to come, and of course that means having an Easter egg hunt! This past weekend we invited our friends to bring their baskets and come have some fun! The party was outside at a fabulous local park and the perfect setting for our fun filled afternoon. I used the Easter party package from Dimpleprints to create this bright and fun party. I had a short turn around time and put the party together in 2 weeks, but I love how it turned out and it just might be one of my favorite parties so far! Here are some of the pictures from the party. I originally saw the idea for the bunny cupcakes here, but didn’t have time to make the cookie version so I took the easy route and cut out bunny ears in white card stock on my Cricut and the inner piece from the patterned paper. I wrapped the cupcakes with coordinating cupcake wrappers and added the ears and face. Aren’t they cute? I love Oreo cake balls, they’ve become one of my favorite party foods! They looked super yummy in this basket of grass. The kids tables were set with whirly twirly centerpieces and cute party hats. Other party decorations I made included this cute Hippity Hoppity Happy Easter sign, wooden Easter eggs and the cutest little chick. Since the kids were going to be getting lots of loot from the egg hunt I kept the party favors simple. I made custom lollipop covers (tutorial coming soon) and put them on a table with subway art from Lolly Jane and a jelly bean and peep flower arrangement. Finally, what they had all been waiting patiently for…Easter Egg Hunt time! With Easter baskets in hand the kids raced off to find their treasures. We had so much fun and enjoyed the afternoon with our friends! I look forward to making this a tradition we enjoy year after year! Stay tuned I have lots more details and how-to’s to share. GORgeous!!!! I ooohed & aaaahed thru the whole post! I hope you'll stop by the Pretty Packages Party and share your lovely party. wow this is amazing! truly amazing. love it. Oh my goodness could this be any cuter, I love all of your sweet simple ideas, and can't get enough of those bunny cupcakes, so cute! I am your newest follower and can't wait to see more! Stop by and say hi when you get the chance! This is so awesome! What an amazing Easter Egg Hunt party! This is the cutest Egg Hunt party ever! This post is full of great ideas, thanks so much for linking up! I am also sharing this on my Facebook page! What a truly festive party! And, super yummy too! I have a easter cupcake tutorial on my blog, about six or seven posts back from my current post. You might like them. Might be something different for next years party. So glad you linked up the gorgeous party! I featured you today! Feel free to stop by and grab a button! Featured this amazing party today..hope you'll grab a button and link up again this week! I have come back to this twice now for inspiration for my own Easter egg hunt– your tables are perfect and I love the bunny hop idea! Cute, cute! Beautiful Easter Eggs. I can use them for my easter party. Thanks for sharing. Your Easter party is seriously so stinking cute!! 🙂 I LOVE it!!! Thank you for sharing such a fun and cute party with us. This was such a great party! I featured you on Fun Friday Finds today!